Thank you for taking time to stop by our website to get to know us better. I’m Dr. MJ Lewis and I was born and raised in Roswell, New Mexico. I received my Doctorate of Chiropractic degree in Dallas, Texas in December 2014. I married my best friend Catie Lewis, who is also a great Chiropractor with a primary focus on pediatrics and pregnancy. We have recently moved to Roswell together to serve and love the community by encouraging and pursuing a healthy life! Our health is our greatest asset and I once heard a quote that drives me today, “A person with their health has 1000 dreams and the person without their health has 1 dream, to get healthier!”(Unknown author) We know that without our health we have nothing. I am grateful that you have chosen to let me walk aside you in your health and wellness journey! My primary focus is to care for the body as a whole and not individual organ systems. We focus on the master system of the body, the Nervous System, which is effected by adjusting the joints of the body and stimulating information to the brain. Our approach is to maintain proper WHOLE body function through Chiropractic, diet, exercise, and/or supplementation. Let Dr. MJ Get to Know You! 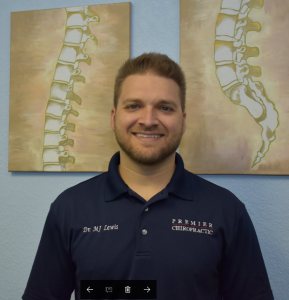 Please consider us when looking for a new Chiropractic experience, and please contact us if you have any questions. May your day be blessed and ever Joyful!